I have been teaching myself how to make preset shapes and I have some Christmas Shapes for you. These were made in PSPX and I have no idea how they will translate to other versions so if anyone can let me know that would great! 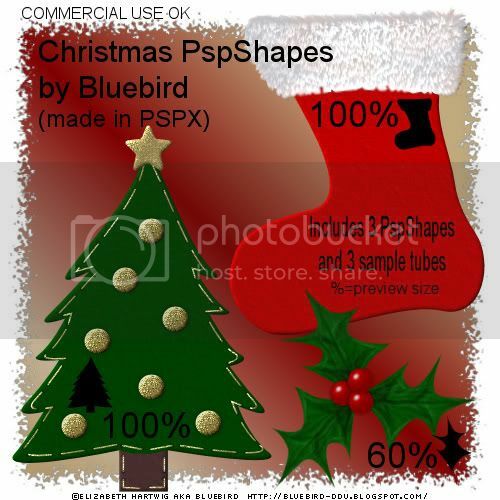 I have included the three sample tubes in the download for those that don't have PSP or in case the shapes don't work for you. The % sign on the preview is the size of the tube and the black shape is what the actual preset shape looks like. Have fun creating! Thank you for your freebie !Hugs from the Christmas Scrapbooking Freebies !